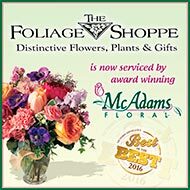 We hope you enjoy your fresh living plant from McAdams Floral. Plants add a warm and beautiful aesthetic to any room in your home or office. Properly caring for your plant will help it grow and thrive. Although water, light and fertilizer needs vary by plant variety; here are some general tips for a longer lasting and healthier plant. Water thoroughly when the top 1” of soil is dry to the touch. Let excess water drain from the pot to prevent root rot. Do not allow plants to stand in water. Avoid constantly soggy soil from over watering. This causes bacterial and or fungal growth which leads to plant disease. Avoid wetting plant leaves by pouring water into soil at the base of the plant. 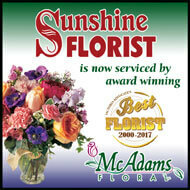 Most green plants do well in medium light locations and out of direct sunlight. They prefer natural indirect light from a window but can also thrive in office fluorescent light. Most flowering plants need bright indirect light (no direct sunlight) to maintain vibrant flower color and promote opening of new blossoms. Display your plants in a moderate temperature location (65F-75F preferably). Avoid excessively hot or cold locations, next to windows or atop radiators or televisions. Keep plants out of drafts caused by ceiling fans or heating and cooling vents. Protect your furniture or floors. Put protective material under pots to avoid damage from moisture. Plants clean the air by taking in carbon dioxide during photosynthesis and releasing oxygen into the air. They take in certain other pollutants as well, including benzene, formaldehyde and trichloroethylene. These are all present in homes and offices because they are emitted by furnishings, building materials and office equipment. Under controlled conditions, certain houseplants were found to remove 87 percent of indoor air pollutants within 24 hours. For best results in air purification, research suggests using one potted plant per 100 square feet of home or office space. Combine several varieties of potted plants to alleviate the broadest range of common indoor airborne irritants.